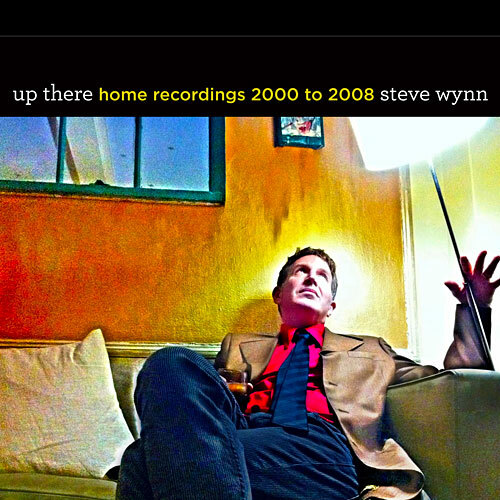 Recorded and Performed (except otherwise indicated) by Steve Wynn at Up There Studios (New York City) between 2000 and 2008. About that title. My first label and very modest home studio was called Down There, named for the basement apartment where I lived in Los Angeles back in the days leading up to the Dream Syndicate. Since then I have moved many times-from apartment to apartment AND from label to label-and have spent the last 18 years living and doing my home recording in my 5th floor apartment on the Upper West Side of Manhattan. Hence, Up There Studios. Get it? Now that I'm moving on to another location (with another wildly clever studio name, I'm sure), it seems a good time for a wrap-up of some of the music I've made from home over the last decade or so. 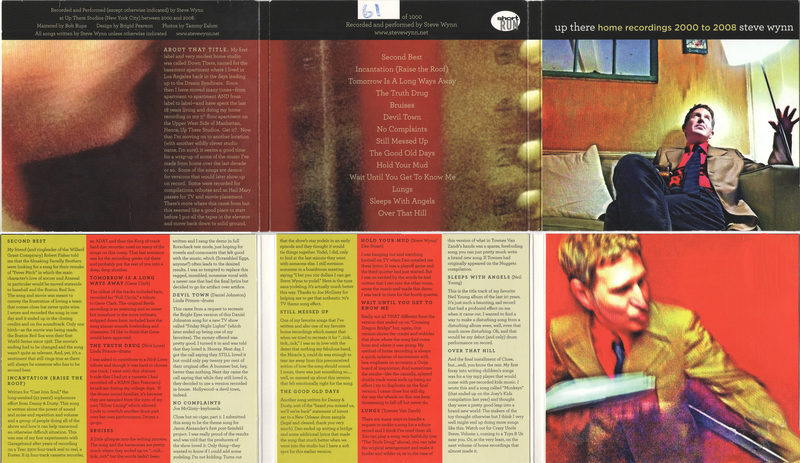 Some of the songs are demos for versions that would later show up on record. Some were recorded for compilations, tributes and as Hail Mary passes for TV and movie placement. There's more where this came from but this seemed like a good place to start before I put all the tapes in the elevator and move back down to solid ground. My friend (and ringleader of the Willard Grant Conspiracy) Robert Fisher told me that the filmaking Farrelly Brothers were looking for a song for their remake of "Fever Pitch" in which the main character's love of soccer and Arsenal in particular would be moved stateside to baseball and the Boston Red Sox. The song and movie was meant to convey the frustration of loving a team that comes close but never quite wins. I wrote and recorded the song in one day and it ended up in the closing credits and on the soundtrack. Only one hitch-as the movie was being made, the Boston Red Sox won their first World Series since 1918. The movie's ending had to be changed and the song wasn't quite as relevant. And, yet, it's a sentiment that still rings true as there will always be someone who has to be second best. Written for "Cast Iron Soul," the long-awaited (23 years!) sophomore effort from Danny & Dusty. This song is written about the power of sound and noise and repetition and volume and a group of people doing all of the above and how it can help transcend an otherwise difficult situation. This was one of my first experiments with Garageband after years of recording on a Teac 3300 four-track reel to reel, a Fostex X-15 four-track cassette recorder, an ADAT and then the Korg 16-track hard disc recorder used on many of the songs on this comp. That last sentence was for the recording geeks out there and probably put the rest of you into a deep, deep slumber. 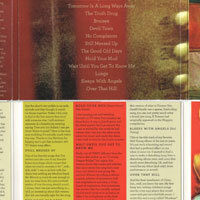 The oldest of the tracks included here, recorded for "Full Circle," a tribute to Gene Clark. The original Byrds recording is so yearning and so sweet but somehow in the more intimate, stripped down form included here the song almost sounds foreboding and obsessive. I'd like to think that Gene would have approved. I was asked to contribute to a Nick Lowe tribute and though it was hard to choose one track, I went with this obscure b-side that I had on a cassette I had recorded off a KSAN (San Francisco) broadcast during my college days. If the drums sound familiar, it's because they are sampled from the intro of my own "Silver Lining" which allowed Linda to overdub another drum part over her own performance. Drums a go-go. A little glimpse into the writing process. The song and the harmonies are pretty much where they ended up on ...tick...tick...tick... but the words hadn't been written and I sang the demo in full Rorschack test mode, just hoping for vowels and consonants that felt good with the music, which (Scrambled Eggs, anyone?) often leads to the desired results. I was so tempted to replace this ragged, mumbled, nonsense vocal with a newer one that had the final lyrics but decided to go for artifact over artifice. This came from a request to recreate the Bright Eyes version of this Daniel Johnston song for a new TV show called "Friday Night Lights" (which later ended up being one of my favorites). The money offered was pretty good. I turned it in and was told that they loved it. Hooray. Next day, I got the call saying they STILL loved it but could only pay twenty per cent of their original offer. A bummer but, hey, better than nothing. Next day came the call saying that while they still loved it, they decided to use a version recorded in-house. Hollywood--a devil town, indeed. Close but no cigar, part 2. I submitted this song to be the theme song for Jason Alexander's first post-Seinfeld project. I was really proud of the results and was told that the producers of the show loved it. Only thing-they wanted to know if I could add some yodeling. I'm not kidding. Turns out that the show's star yodels in an early episode and they thought it would tie things together. Yodel, I did, only to find at the last minute they went with someone else. 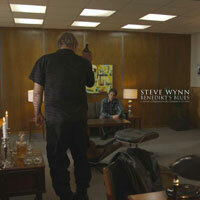 I still envision someone in a boardroom meeting saying "I bet you 100 dollars I can get Steve Wynn to yodel." Here is the tune sans-yodeling. It's actually much better this way. Thanks to Joe McGinty for helping me to get that authentic 70's TV theme song effect. One of my favorite songs that I've written and also one of my favorite home recordings which meant that when we tried to recreate it for "...tick...tick...tick," I was so in love with the demo that nothing my fabulous band, the Miracle 3, could do was enough to tear me away from this preconceived notion of how the song should sound. I mean, there was just something so...well, so messed up about this version that felt emotionally right for the song. Another song written for Danny & Dusty, sort of the "heard you missed us, we'll we're back" statement of intent set to a New Orleans drum sample (legal and cleared, thank you very much). Dan ended up writing a bridge and some additional lyrics that made the song that much better when we went into the studio but I have a soft spot for this earlier version. I was hanging out and watching football on TV when Dan emailed me these lyrics. It was a playoff game and the third quarter had just started. But I was so excited by the words he had written that I ran into the other room, wrote the music and made this demo. I was back in time for the fourth quarter. Really not all THAT different from the version that ended up on "Crossing Dragon Bridge" but, again, this version shows the cracks and wobbles that show where the song had come from and where it was going. My method of home recording is always a quick, splatter of excitement with less emphasis on accuracy, a Ouija board of inspiration. And sometimes the results-like the casually, splayed double track vocal ends up being an effect I try to duplicate on the final version. I came close but still dig the way the wheels on this one keep threatening to fall off but never do. There are many ways to handle a request to tackle a song for a tribute record and I think I've tried them all. You can play a song very faithfully (see "The Truth Drug," above), you can take the original arrangement and make it louder and wilder or, as in the case of this version of what in Townes Van Zandt's hands was a sparse, foreboding song, you can just pretty much write a brand new song. If Townes had originally appeared on the Nuggets compilation. This is the title track of my favorite Neil Young album of the last 20 years. 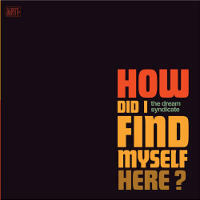 It's just such a haunting, sad record that had a profound effect on me when it came out. I wanted to find a way to make a disturbing song from a disturbing album even, well, even that much more disturbing. Oh, and that would be my debut (and only) drum performance on record. And the final installment of Close, but well, you know the rest. My first foray into writing children's songs was for a toy mp3 player that would come with pre-recorded kids music. I wrote this and a song called "Monkeys" (that ended up on the Joey's Kids compilation last year) and thought they were a pretty good leap into a brand new world. The makers of the toy thought otherwise but I think I very well might end up doing more songs like this. Watch out for Crazy Uncle Steve, Volume 1, coming to a Toys R Us near you. Or, at the very least, on the next volume of home recordings that almost made it.